We’d like to say thank you by offering our valued customers discounts on our services. Stop in to take advantage of our specials today! Sign up for Secure Check Direct Deposit for your Government Benefits or your Payroll Check and We Will Give You $10.00*! 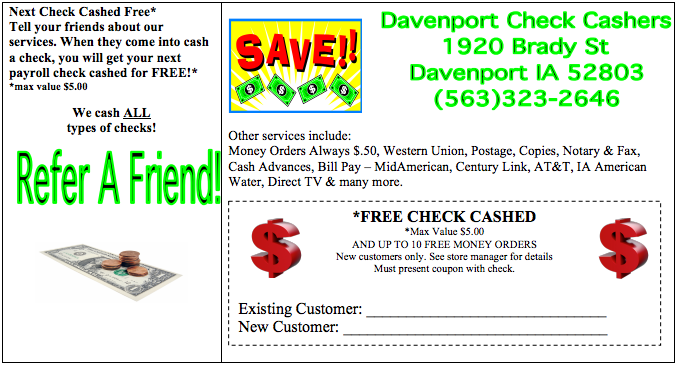 Cash 9 Checks and Get Your 10th Check Cashed For Free! $20.00* max value. Refer A Friend to do a Payday Advance and Earn $25.00*! Ask Us How You Can Qualify Today. *Promotions and amounts are subject to change. Certain restrictions may apply. Visit or call us for details. We would love to send you future promotions as they become available. If you are interested, simply enter your email address below! Click here to print and give to your friends!